Like the ending to a great book or movie, the 18th hole of a golf course should offer an experience that’s both satisfying and memorable. William Bell, the designer of Torrey Pines and many other public courses in San Diego, did some of his best work on No. 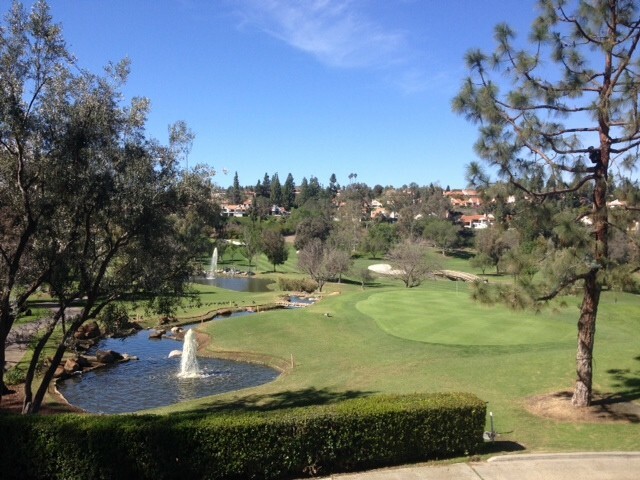 18 at Rancho Bernardo Inn, a hole that’s as scenic as it is strategic. This closing par 5 begins with a decision off the tee: Do you try to drive the culvert crossing the fairway at around 250 yards or do you lay up? From there, it’s all about positioning to this uphill hole protected by ponds and a stream. That’s a lot of watery waters for things to go wrong trying to reach this narrow, triple-tiered green. But whether you make birdie or bogey, the setting, which includes two fountains, makes the hole and experience unforgettable. 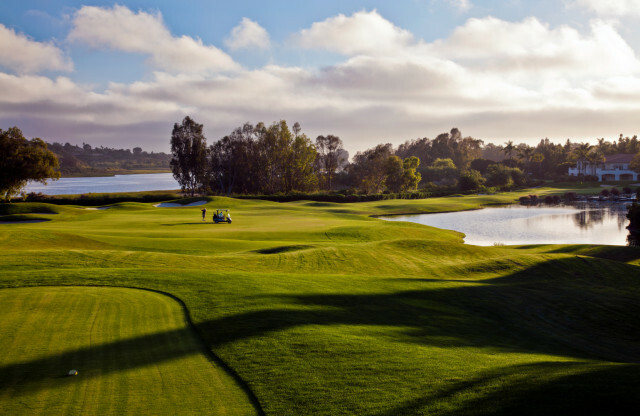 Possibly the most beautiful finishing hole in San Diego is also its most difficult. 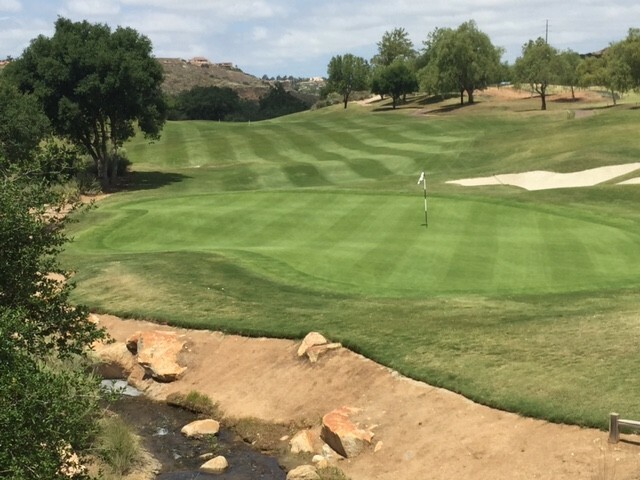 This dogleg right par 4 wraps around a lake with a magnificent waterfall and offers a gorgeous view of Batiquitos Lagoon on the left. The lake is a popular destination for tee shots – and second shots, as finding the fairway is no guarantee of anything. The second shot, while played to a sizeable green, is deceivingly difficult. 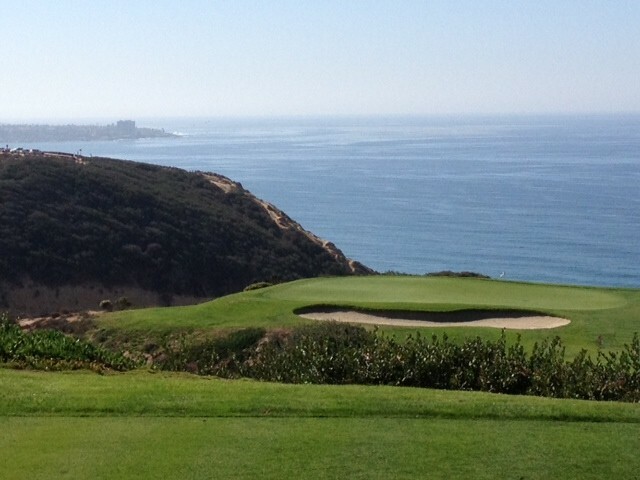 The approach is played into a Pacific Ocean breeze that can push your ball right into the water or out-of-bounds left. Par feels like a birdie here. The pros on the LPGA Tour are even tested by this one. This straight away par 5 starts with an elevated tee shot over a ravine to a fairway where a majestic giant oak marks the right side. Aim for the oak and then pour all you’ve got into your second shot on this long finishing hole. The green is situated in front of the Maderas clubhouse, which has the look of an Italian villa. You can putt out and then retire to the patio and enjoy a great view of the hole you just played. Design-wise, this flat, straightaway closing par 5 may seem fairly ordinary, but what’s happened here makes it extraordinary. As the finishing hole for the PGA Tour’s Farmers Insurance Open, it gets the most TV time of any hole in San Diego. But the lore of No. 18 really ties back to 2008 and the iconic U.S. Open. This is where Tiger Woods trickled in a tricky 12-foot birdie to force the playoff with Rocco Mediate that made that Open legendary and turned Torrey into hallowed ground in golf. Here’s your chance to recreate history. 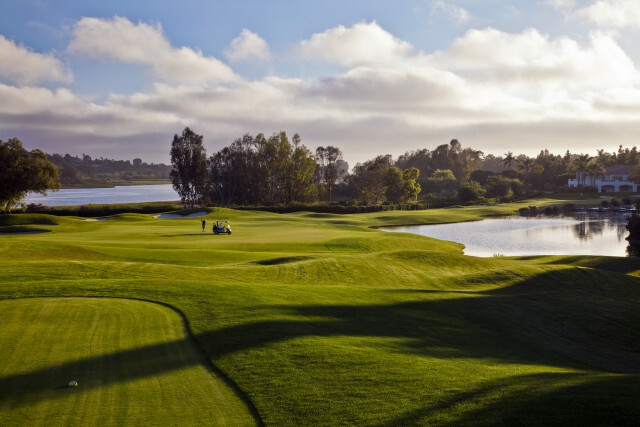 With nearly 90 courses to choose from, golf in San Diego is a veritable feast for your game – and your senses. From jaw-dropping elevation changes and stunning sweeping vistas to breath-taking ocean views and brilliant botanical beauty, San Diego courses have all. The following is an all-too-brief list of some of the most camera-phone worthy holes in San Diego. The view from Hole 3 at Torrey Pines is worth the greens fee alone. This iconic par 3 on the South Course, site of the 2008 and 2021 U.S. 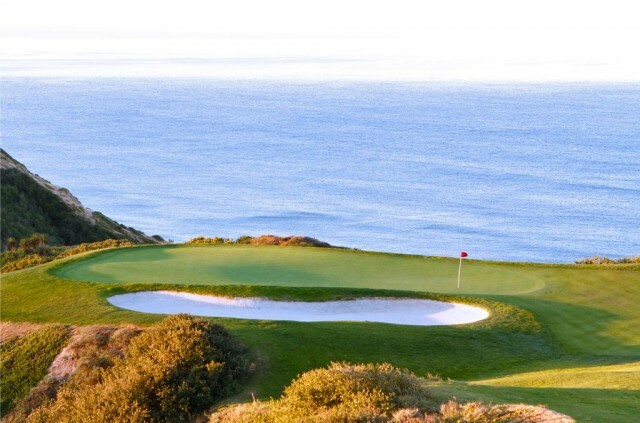 Opens, is San Diego’s most famous golf hole. Golfers worldwide make the pilgrimage just to hit this elevated tee shot and watch their ball soar into the blue horizon of the Pacific Ocean in the backdrop. There’s also the captivating view of La Jolla in the distance. Played mostly from 160 or 149 yards, this isn’t the toughest hole at Torrey by any stretch, but it’s certainly the most memorable – and photogenic. Its sister par 3 is No. 6 on the North, which features a nearly 200-foot drop to the green and plays directly into an ocean breeze. A birdie on either hole is a bonus. A whale sighting is a double bonus. 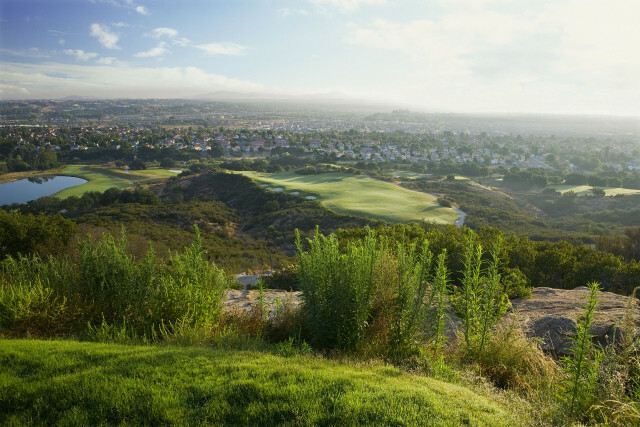 You’ll feel like Paul Bunyan when teeing off from Journey at Pechanga’s #6. After playing irons shots at Torrey, it’s time to pull out driver to play this awesomely elevated par 4 at Journey at Pechanga. Trust us when we say you will remember the first time you get a glimpse of this tee shot. You’re basically hitting the ball off the side of the mountain and watching it soar like a dimpled seagull to the dogleg-left fairway below. The backdrop is a vast overview of Temecula that makes it seem like you can see all the way to wine country. And cheers to you if you hit a big one here. You’ll feel like Paul Bunyan. If this hole doesn’t make you want to play golf, I don’t know what would. 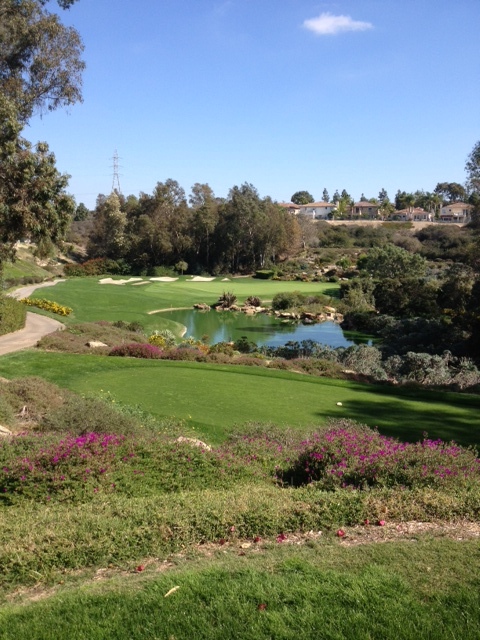 Aviara, which is literally an 18-hole botanical garden, has several worthy candidates, but we have an affinity for No. 14, which is in the most remote part of the course. Like holes No. 3 and 11, 14 is an impeccably landscaped and elevated par 3 played over water. The green here is huge and gives you a second scenic treat when you reach it. To the left is a beautiful waterfall complex that’s home to an array of water birds splashing in the pond and soaring in the skies. A Golf Channel announcer said of No. 14 once, “If this hole doesn’t make you want to play golf, I don’t know what would.” Our sentiments exactly. 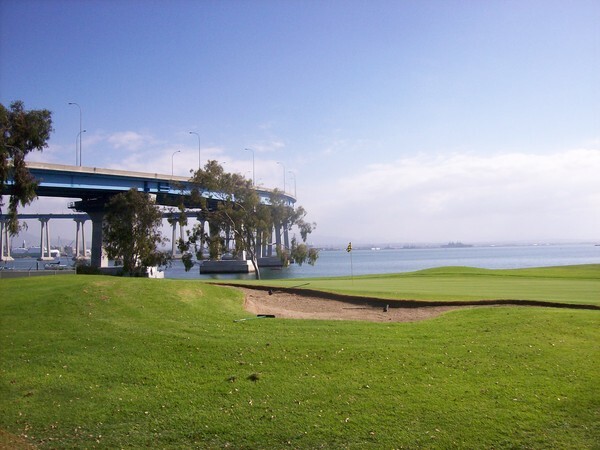 The setting of the Coronado course – surrounded by San Diego harbor – makes it unique, but the glimpse you get of the Coronado Bay Bridge, a San Diego landmark, on holes 2 and 3 in particular is something special. We’re going with hole No. 3, a par 4, for the list because it gives you the most unobstructed view. As you progress through your round, you’ll also catch glimpses of passing Navy ships, downtown San Diego and the Hotel Del Coronado. Being perfectly flat, it’s an ideal course to walk and take in the evolving scenery around you. The view at the par-4 7th at Encinitas Ranch isn’t so much about what’s in front of you as what’s behind. Looking back from the tee box, you can see a sweeping view of the two previous holes and a familiar blue hue in the background (the ocean). The scene is a pleasant surprise the first time you play the course and something you forward to when you return. And a bit like No. 14 at Aviara, this hole offers two distinct visual experiences. Your downhill approach is to a green accented by two star pines and a vast view of the valley beyond. When walking off the green, don’t forget your clubs – or to take a picture. 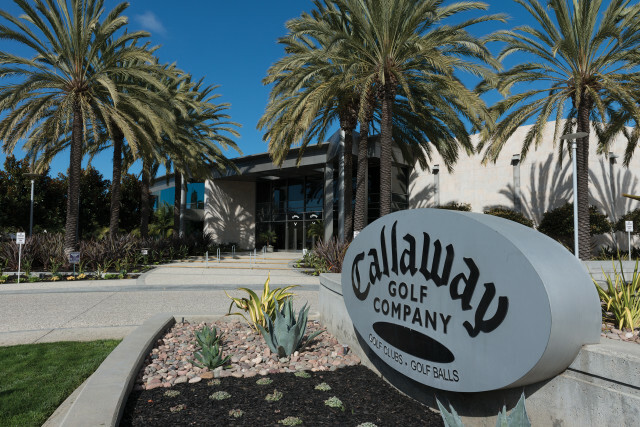 As the home of the headquarters of TaylorMade Golf, Callaway and Cobra, Carlsbad, in San Diego’s North County Coastal region, is akin to the Silicon Valley of the golf equipment industry. The game-changing birth of the metal wood occurred in Carlsbad and those companies been leading the technology boom that has revolutionized the game ever since. Carlsbad presents a rare opportunity to visit all three of these influential brands at once. They are all headquartered within a few miles of each other. TaylorMade, however, is the only one still offering regularly scheduled public tours. They take place every Thursday at 10:00 AM. Cobra books private tours by appointment, while Callaway only books club fittings. The following is a look at highlights and tips for taking the TaylorMade Tour, followed by information for booking appointments at Callaway and Cobra. Please Note: TaylorMade is suspending tours for the rest of 2017 and is unsure as to when tours will restart. As most any golfer knows, TaylorMade is the world’s leading equipment manufacturer. Their campus encompasses two buildings – only one of which you see on the tour – and the driving range, the hallowed Kingdom, a domain for the pros and other elite players. The TaylorMade tour offers some insight into the company’s latest club technology – the new R15 driver is under glass in the lobby with the club head dissected– as well a peek at the manufacturing process and an overview of golf’s technology revolution. A rotating team of TaylorMade volunteers hosts the roughly 45-minute tour every Thursday, so your experience may differ depending on their experience. For instance, our host was an engineer named Matt, so we got a more technology-based tour. Regardless of the host, be prepared to provide your ID and sign an electronic confidentiality agreement while you’re waiting. Note: No photos or phones on the tour. While you’re waiting for the tour to begin, you can peruse the latest TaylorMade equipment, which is on display in the lobby along with the staff bags as such TaylorMade Tour players as Justin Rose, Jason Day and Sergio Garcia. 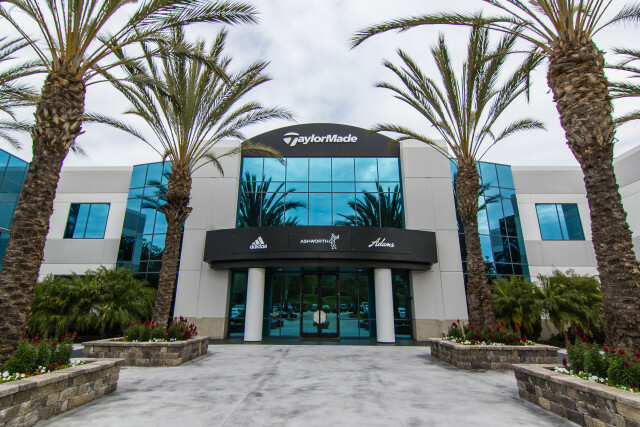 The tour begins with a bit of history about not only TaylorMade but its parent company, Adidas, a high-performance sports apparel manufacturer. For golf, the most pertinent history is the story of Gary Adams bringing TaylorMade to Carlsbad to pursue his dream of launching a medal wood to supplant the wooden clubs of the past. That history is displayed under glass in the next story of the tour – the Wall of History. There, 12 clubs are exhibited that capture the evolution of the metal era. There’s everything from TaylorMade’s first driver, the head of which is about the size of a modern-day rescue club, to the latest, the state-of-the-art R15. In between, you witness club head sizes growing, metal materials changing and then club adjustability coming into the picture. Even for those who know their club history, there’s likely something to learn and appreciate here. The next stop is the manufacturing floor, where 10,000 clubs are assembled each day. 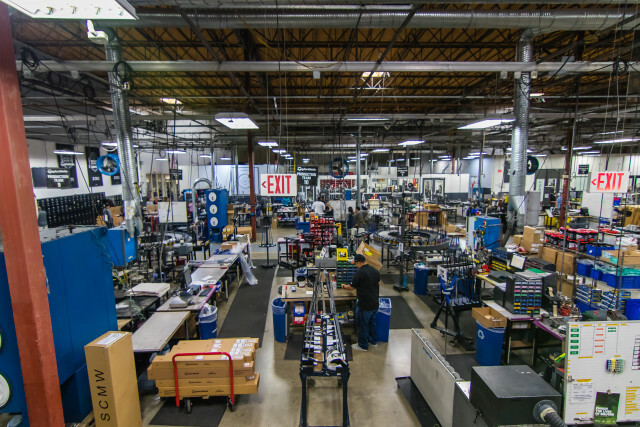 You see everything in production from putters to drivers and learn what a golf assembly line looks like. The manufacturing floor shares space with the massive warehouse where thousands of equipment orders are being processed and shipped daily. The tour concludes with a look at one of the most exclusive parts of TaylorMade – The Kingdom. Golfers are usually only granted access here with permission of a club pro and to be professionally fitted. Otherwise, this is where TaylorMade’s professionals come to get their equipment updated in a state-of-the-art environment and to practice on the driving range. The Kingdom has a country-club feel all its own, complete with a posh lounge just inside the entrance. Worth perusing: the guestbook at the front desk. Inside, you’ll find photographs and signatures from touring pros and celebrities who’ve visited The Kingdom. It’s a veritable Who’s Who. Who was Adidas’ first sponsored athlete (hint: think track)? Where does TaylorMade gets its name from? Why did Gary Adams chose to relocate his company to San Diego? What does the R stand for on TaylorMade’s drivers? If some of those questions pique your interest, the TaylorMade tour has answers for you. If your visit coincides with one of the professional tour events in San Diego, you might end up keeping company with a tour pro. To register for the Thursday tour at TaylorMade, call 760.918.6000. Cobra Puma, the company represented by the stylish Rickie Fowler, has designated times of the month when tours are available, but they are by appointment only. Cobra has more modest facilities than TaylorMade, but there are still things to be seen, including the hitting bay and swing simulator the pros use at Cobra. 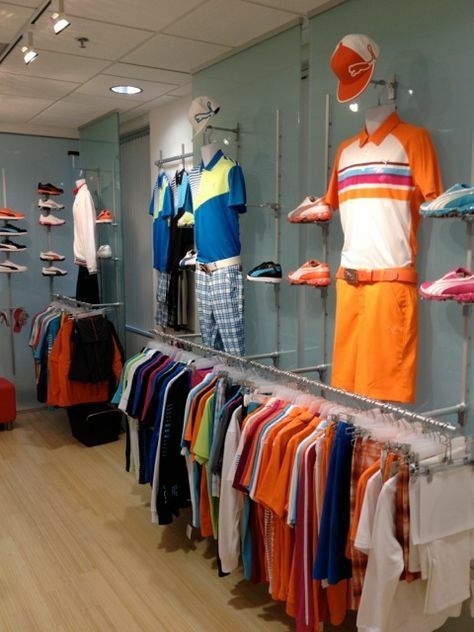 There’s also a warehouse and merchandise area where the colorful array of the Cobra Puma product line is displayed. The tour can take 30 minutes to an hour depending on what guests want to see. Working in a club fitting can add another hour or two. To schedule a tour, a fitting, or both, call 760.710.3502. Callaway Golf no longer offers public tours, but the headquarters does accommodate club fittings.